If you’re reading this blog, then chances are you’re already sold on the benefits of eating healthy and eating more plants, or at least starting to warm up to the idea. Eating healthy has such a bad wrap in mainstream society. I’m still so surprised by how many people tell me that they think my dietary choices must be so difficult and some huge sacrifice. The truth is, nothing was all that difficult to give up. I’ve made choices for my health and I’d like to think that I’m not sacrificing anything and that if my body really craved something, I would just eat it rather than deprive myself, but I don’t ever crave meat and I’ve always preferred vegan sugar free desserts, even before I gave up dairy and sugar. I make efforts to avoid refined carbs, but it’s unavoidable when eating out and travelling, and sometimes some locally sourced fish is the most healthful meal on the menu, so occasionally I might have that. Overall, I’m conscious of everything that goes into my body, the effect it has on my health and the world at large, and that’s the important thing. People are starting to warm up to the idea of eating less meat, sugar and refined carbs but there’s still so much work to be done to educate people about food and it’s powerful role in our health, not to mention the eco system and a slew of other world issues that we all should be cognizant of these days. But that’s a discussion for another time. Among some there seems to be an obsession with replacing meat at the center of the plate and there’s a whole industry thriving off of the creation of highly processed artificial plant-based foods that replicate the taste and texture of meat. I know there’s a nostalgic and convenience element to processed foods and they certainly are ok once in a while, I admittedly fall victim to them at times myself, but it’s problematic when they become the prevalent way we feed ourselves. So I generally do my best to limit my consumption of these highly processed foods. At thanksgiving, I created a recipe for Holiday Stuffed Hokkaido Squash, a beautiful center of the table main course for those who wanted to save the turkey. While I realize that some people do it out of nostalgia and tradition, it’s not really necessary to have a turkey or roast shaped dish at the center of your table and it’s ok to create new traditions of your own. In anticipation of the upcoming holidays I wanted to share a wonderful seasonal plant-based main course idea that would look lovely at the center of the table. I hope it serves as an inspiration for your next feast, whether you’re celebrating Easter, Passover, the arrival of spring or an average Monday night. 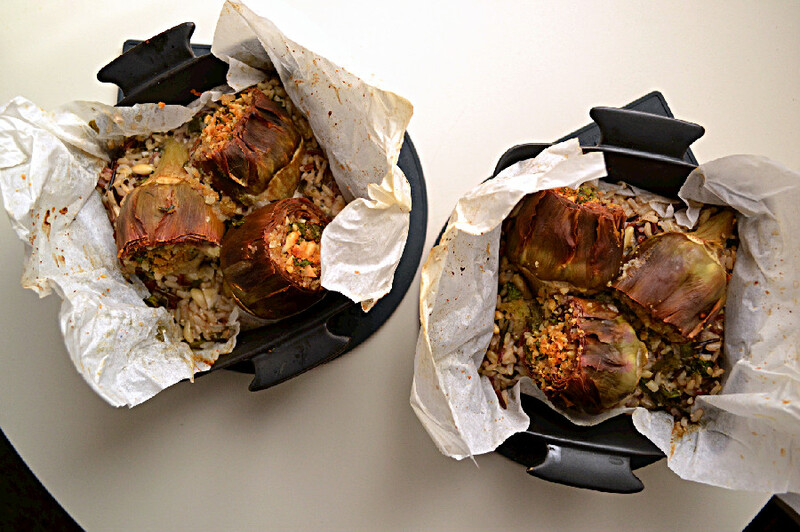 I made these nut stuffed baked artichokes over a mixed brown, red and wild rice pilaf with baby spinach in individual size casserole dishes, but this could also be made in a larger casserole dish and the recipe is easily doubled to feed more people. It’s also versatile in that you can add chickpeas or lentils to the pilaf, to make it a complete protein source, you can replace the nuts with sunflower and pumpkin seeds or use all bread crumbs if you have a nut allergy or are feeding someone with one, and you can change the herbs and seasoning to your liking. I’ve talked about the health benefits of artichokes in this post if you want to know more about this delicious spring vegetable and all the goodness it offers.I’m going to take a moment to address brown rice and complex carbs here today. Brown rice is an excellent source of dietary fiber, vitamin B6, calcium, magnesium and iron, and selenium among other vitamins and minerals. It is also an important source of Vitamin E (tocopherol), which is an important antioxidant that helps prevent the oxidation of fats in the body. It also helps stabilize blood fats abd protects against free radical damage. Unlike polished white rice which has been stripped of virtually all of its vitamins and minerals (70%), brown rice is made by removing only the outer inedible hull, which is what keeps it nutrient rich. This makes brown rice a complex carbohydrate while white rice acts like a simple carbohydrate or sugar in the body. What this means is that brown rice takes longer to digest, keeps you satiated longer and is much lower on the glycemic index than white rice. Brown rice is also an important protein source for a plant based diet and while it may not contain all of the essential amino acids on its own, it is easily combined with beans, lentils, nuts, seeds or mushrooms to form a complete protein source. That said, it’s not absolutely necessary to combine protein sources in one meal, as long as you’re getting all of the amino acids in your diet over a 24 to 48 hour period you’ll be fine. While it does have a longer cooking time than white rice, brown rice is much more flavorful, imparting a nutty, sweet taste. Check out my Grains & Pasta feed for more ideas to help you incorporate brown rice and other whole grains in your diet, from breakfast porridge, to Italian risotto, and grain salads. This seasonal dish makes a great center of the table main course. 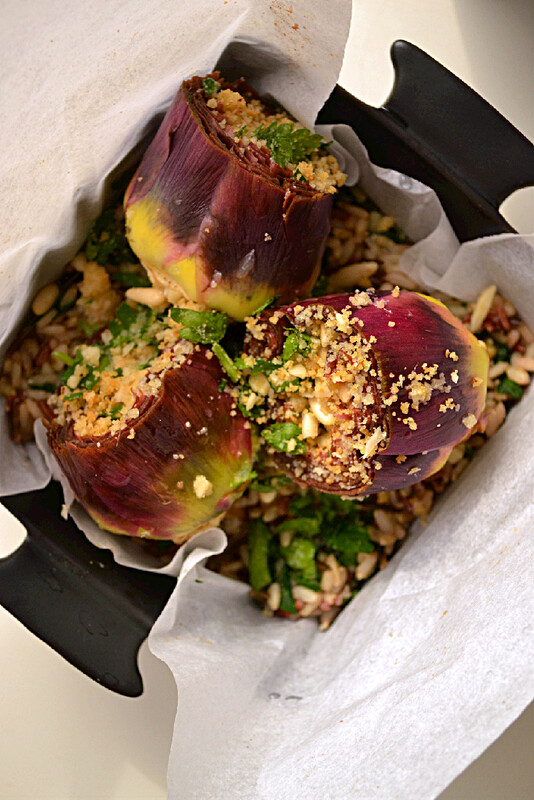 Artichokes are stuffed with a mixture of almonds, bread crumbs pine nuts and herbs and seasoned with salt, pepper and my vegan walnut parm, layered over a bed of brown, red, and wild rice with spinach, and baked to perfection. Add rice and 2 cups of water to a pot and bring to a boil. Stir in seasoning, reduce heat and simmer uncovered until rice is parboiled/half cooked, and most but not all of the water has been absorbed. Remove from heat, but do not drain. Coarsely chop the spinach and stir it into the parboiled rice. There should still be a bit of liquid at the bottom of the pot, but it shouldn’t be soupy. Fold in chickpeas, if using. Prepare a lemon water bath for the artichokes. Fill a large bowl with filtered water and add the juice of half a lemon. Prep the artichokes by slicing them in half, horizontally, to remove the prickly tops. Remove tough outer leaves until you reach the tender yellow/purple parts. Peel the stems with a paring knife. Using a small pointed spoon, gently separate the leaves and remove the fuzzy prickly choke from the center. Its tricky at first but you get the hang of it after the first one. This will leave a nice cavity in the center of the artichoke that you can stuff. Place each artichoke in the lemon water bath immediately after you’ve cleaned it so they don’t oxidize and brown. Set them aside, in soaking water, until ready to stuff. Prepare the stuffing by mixing together bread crumbs, chopped almonds, crushed garlic, walnut parm, pine nuts and chopped parsley. Season with fine sea salt and fresh ground black pepper to taste. Add a very light drizzle of olive oil or a squeeze of lemon juice to dampen the mixture slightly and toss it all together. Line baking dish (es) with parchment paper, making sure the sides are long enough to fold over the mixture. Spoon the rice and spinach mixture into the dish (es), liquid included. If the mixture is too dry, add a bit of water (2-4 tbsp per dish or 1/4 – 1/2 if you are using only one large dish) as it will serve to produce steam and cook the rice and artichokes in the oven. Be careful not to add too much water though, you don’t want rice soup. Drain the artichokes and fill their cavities to the brim with the stuffing mixture. Place on top of the rice, sprinkle any remaining stuffing mix on top and add a squeeze of lemon juice. 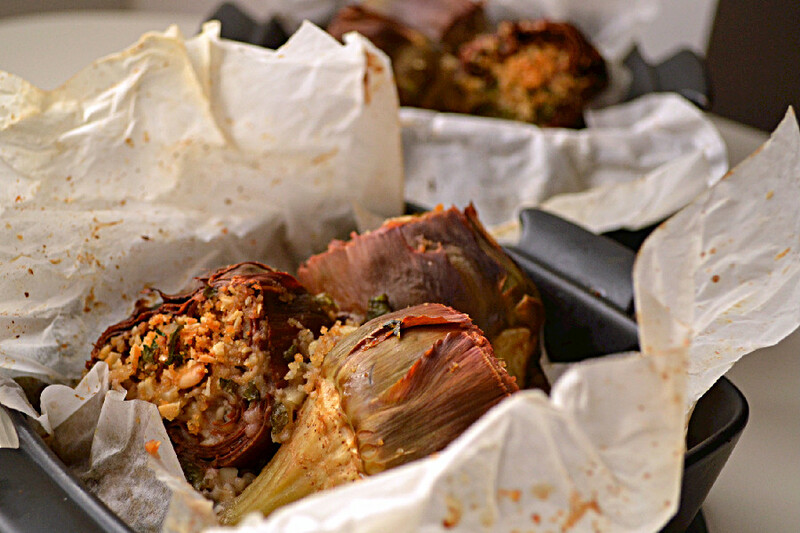 Fold the parchment paper over, to cover the rice and artichokes completely. Cut out squares of parchment paper the same size as the baking dishes, wet them and scrunch them to squeeze out the access water and place them on top of each dish, to trap the moisture and steam inside during baking. Place on the center rack and bake until the rice and artichokes are fully cooked, about 40 minutes. Remove from oven, and keep covered in parchment paper until ready to serve. You could spoon out the mixture into a serving dish or simply peel away the parchment paper and place it on the table as it is, like I did in the photos. Serve with a squeeze of lemon juice and some walnut parm and a drizzle of olive oil if desired. Oh thank you so much Audrey. Trust me you’d want to eat it. It’s truly delicious.